Includes the complete season 5 plus the 2015 Christmas special. Call The Midwife series 5 DVD from the BBC created by Heidi Thomas and starring Vanessa Redgrave, Jenny Agutter and Helen George. Inspired by the memoirs of Jennifer Worth, Call the Midwife follows the nurses, midwives and nuns from Nonnatus House convent, who visit the expectant mothers of Poplar, providing the poorest women with the best possible care. From formula milk to television, times are changing in the East End, bringing both opportunity and disappointment. In this series Sister Monica Joan goes missing at Christmas time leaving the nuns and nurses distraught. Shelagh rushes to put together a children's choir in time for a BBC broadcast from the church. And a surprise pregnancy brings one mother unexpected happiness. Elsewhere Trixie, having battled through her issues with alcohol, finds a new purpose in her keep fit classes. After recovering from her accident, Delia walks back into Patsy's life, but will she be there to stay? And could friendship blossom into something more for vicar Tom Hereward and Barbara? 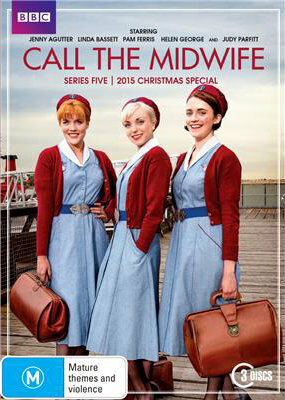 Click the button below to add the CALL THE MIDWIFE - COMPLETE SERIES 5 to your wish list.